Detectives were able to identify a possible suspect in this case. The suspect was positively identified by the victim via a photographic lineup. Detectives subsequently arrested a KNOWN 15 YEAR OLD JUVENILE. On March 25th at or about 2:30 pm, the victim was riding his bicycle on S. Carrollton under the Expressway. As he walked his bicycle around some construction equipment, he was approached by two black male subjects. The suspects were armed with a handgun and robbed the victim of approximately $15 in cash and his cell phone. 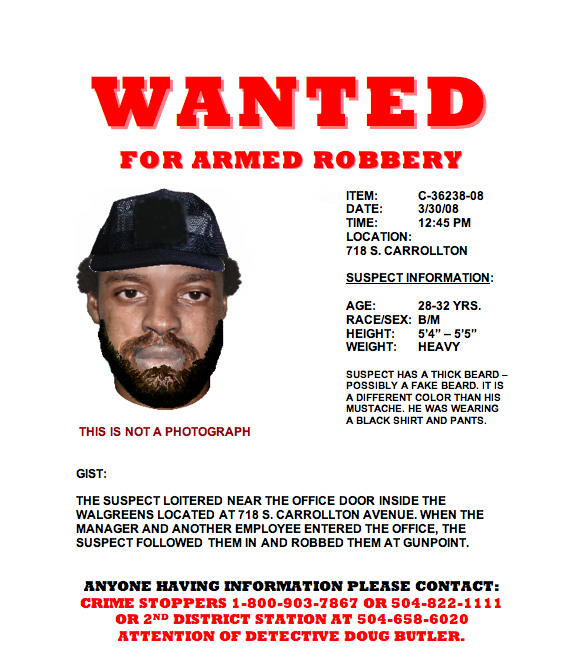 Suspect #1 is described as a 17-19 year old black male, 5’7”, 150 lbs., wearing jeans and a black t-shirt. Suspect #2 is a 17-19 year old black male, 5’5”, 120 lbs., wearing jeans and a white t-shirt. If you have any further information on this case, please contact Sgt. Shaun Ferguson or Det. Douglas Butler at 658-6024 or 658-6020. You may also call Crimestoppers anonymously at 822-1111.